(c) Vanguard Gallery all rights res. Perfect for your dressing room! A fine art 12x18 fine art giclee, signed and numbered on acid free art paper. Brunette, Blonde and Redhead Burlesque Girls in the dressing room! THE SHOWGIRLS IN THE DRESSING ROOM! ROMANTIC GLAMOUR OF PIN-UP GIRLS! Though much of the original pin-up art, calendar and illustrations was thrown away, you can still own an original painting recreated by Daniel Vancas who since 1995 is the first and only Master Elvgren replica and pin-up artist, who's is published and the exclusive artist with Vanguard Gallery, Est 1992! VANGUARD GALLERY EXCLUSIVE NEW RELEASE AND PRODUCTION - SMALL LIMITED EDITION! ONE OF THE BEST FILM FUN BURLESQUE PINUPS by the famous ENOCH BOLLES! Nice larger size. A WWII Bomber Nose Art style pinup cover girls has a real love of lingerie and lace! This rare image never offered before as a fine art limited edition on canvas by Vanguard gallery! PERFECT GIFT FOR THE PASSIONATE PIN-UP, BURLESQUE, JAZZ AGE AND BIG BAND LOVER! Our sizing allows for easy fit on smaller locations and unique decorating spots. LOOKS GREAT OVER THAT VINTAGE ANTIQUE CONSOLE RADIO! THIS IS HIGEST QUALITY FINE ART PRINT GICLEE! SAVE more than 70% OFF THE GALLERY LIST PRICE of $550! SPECIAL PROMOTIONAL SALE + FREE USA SHIPPING FOR FIRST BUYERs! ~ ASK ABOUT LARGER OR SMALLER SIZES ON CANVAS GICLEE OR A HAND PAINTED REPLICA OF THIS... many of these original paintings were lost and thrown away in the 1950's and 60's by the advertising calendar companies. ~ ASK US ABOUT AN ORIGINAL RECREATION PAINTING IF INTERESTED. ~ Highest quality by professional fine art printers, top quality name brand art inks and art papers used in printing. ~ Published by a American Fine art publisher, VANGUARD GALLERY OF CARMEL, and printed in USA! Enoch Bolles one of the top producing Art Deco era pin-up artists, mostly because of the massive exposure his images received on magazine covers and newsstands nation wide.Bolles' pin-ups are the playful and racy flapper girl - clearly influential on many artists of his time. including the later famous Alberto Vargas and George Petty. Enoch Bolles (3 March 1883 – 16 March 1976) was an American painter of pin-up art. He was among the earliest and most widely circulated glamour illustrators. While known today solely as a pinup artist, Bolles was a versatile illustrator who also worked extensively in the advertising industry, creating hundreds of attractive color illustrations for products ranging from bread to cigarettes. His most widely reproduced advertising illustration is the "Windy Girl" for Zippo lighters. This work, produced in 1937, has recently been reissued as the Vargas Windy Girl and has appeared in well over 100 variations on Zippo lighters. He was born in Boardman, Marion County, Florida, the son of Enoch Bolles, Jr., a chemist in the perfume industry, and Catherine Keep. After his father's death, the family moved to Newark, New Jersey, where he met and, in 1903, married Clara Kaufman. They had eight children together, eventually settling in Harrington, New Jersey. Bolles studied at the National Academy of Design, and his first illustrations were published in 1914 on the covers of joke books, such as Judge and Puck. He became best known for illustrating Film Fun. In 1923 he became the exclusive cover artist for Film Fun and continued in this role until the magazine folded in 1943, a victim of the Postmaster General's campaign against 'salacious' material. In addition to his 200 covers for Film Fun, Bolles painted at least 300 more for spicy pulps, including Breezy Stories, Pep and New York Nights. None of this work was signed and most of it remains unattributed. Bolles' monthly lineup of all-American beauties precisely posed in wildly imaginative costumes did much to define the future of American pin-up illustration, and remain popular today. He was also a versatile illustrator who created advertising for many products, including Sun-Maid Raisins and Zippo lighters. Sadly most of the original paintings from these magazine covers, ads and illustrations were thrown away abd few exist today. Vanguard Gallery (see photos of gallery) is a retro to contemporary gallery featuring mostly American Artists, retro, art deco, pinup, illustration, automobile, aviation, WWII, Nose Art, Trains, music icons, Jazz and more. 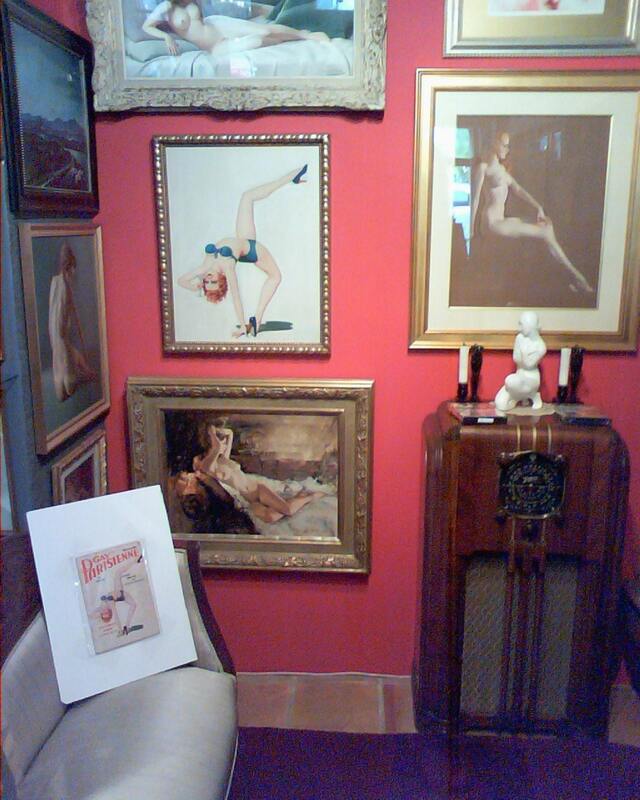 VANGUARD GALLERY ART & ARTISTS: This is a partial list of artists, Elvgren, Vargas ( Varga Girls), Peter Driben, Roy Best, Enoch Bolles, Earl Moran, Fritz Willis, Zoe Mozert, Petty, Connolly, Freid Pal, Frahm, DeVorss, Olivia, Daniel Vancas, DeMartini, Harvey Higley, Wayman, Shugg, Schaub, Riley, Hahn and many more. Our original art paintings and rare prints span the decades from 1920's, 30's, 40's, 50's through 1960's, even 70's and 80's. We also represent contemporary artists. 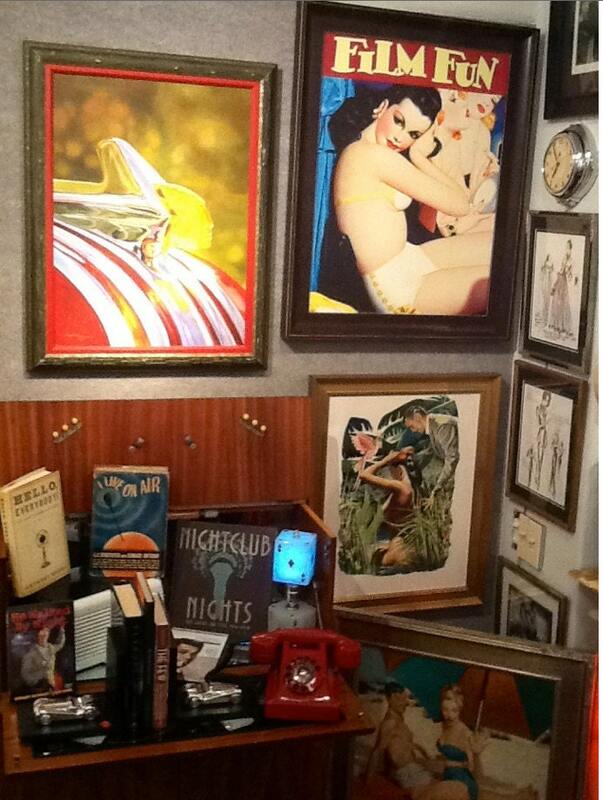 Vanguard Gallery is also the home studio for art director and artist Daniel Vancas, for 15 years known for his fully authorized Elvgren pinup replica paintings and his own unique original art Deco to Modern, illustrative & social realism woks. Vanguard's art celebrates the American popular experience of the 20th Century. VANGUARD GALLERY is located 6TH STREET, Carmel-By-The-Sea, California.